Race Result: Craig Lowndes and Steven Richards have won the 2015 Bathurst 1000 to record Holden’s 30th win at the mountain on Sunday. After qualifying 15th for the Great Race, Lowndes took the lead on lap 118, and held on with great strategy in the end. He and Richards would take the win ahead of Mark Winterbottom and Steve Owen for Prodrive Racing. Like the winning team, Winterbottom and Owen would fight from outside the top ten, to finish 2nd after starting 14th. They also had to contend with electrical gremlins, and a poor start early, to come back into the race and stand on the podium. Garth Tander and Warren Luff would complete the podium, finishing 3rd after starting 22nd. It is the first time since 1987 where the top 3 at the end of the race started outside of the top ten. The race wasn’t without drama either. There were big incidents for Tim Blanchard and Scott Pye, who both hit the wall hard at McPhillamy Park. Jamie Whincup, who led for the middle part of the race, would make a bad judgement at the final set of stops by overtaking the safety car on the track. He thought it showed a green light to allow him through, but replays showed it was flashing yellow and he had to stop. Whincup would receive a drive through penalty and finish 18th. It is the 2nd time one decision has cost the team and drivers dearly. Finally the rain also played its part in the race, coming at around lap 85 in the race. This changed the strategy of the team, and also allowed some drivers to come back into the race. Winterbottom, Tander, and Reynolds, all got a large gain out of it. The Prodrive driver, who dedicated his 2nd place to his team-mate Chaz Mostert, now leads the championship by 399 points. Winterbottom will be tough to beat now after another impressive weekend. The race though belongs to Lowndes and Richards, who have now won 10 Bathurst titles between them. Lowndes, who has won 6, becomes one of just five drivers to win six or more at the mountain. He has three to go to catch his hero, Peter Brock. V8 Supercars will be back in two weeks for the Gold Coast 600. You can read more about the race here and see the full results at the bottom of this page or at the link in this sentence. 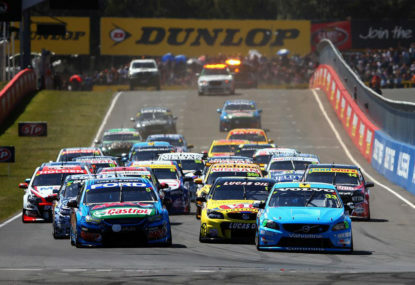 Race Preview: Can 2015’s edition of the Bathurst 1000 live up to last year? Find out as The Roar live blogs the Great Race from 10:30am AEDT on Sunday. At the end of last year’s Bathurst 1000, after Chaz Mostert won on the last lap when Jamie Whincup ran out of fuel, many predicted we would never see anything like that again. 12 months later, after the weekend we’ve had so far, and the threat of rain today, today’s race could replicate and be even better than that. That obviously will be hard with last year’s race throwing up everything including a half time break for oranges and track repairs. The rain today though, if it comes down heavy enough, could provide another red flag scenario. There is an 80 per cent chance of rain with around 3 to 8mm of rain predicted to fall. In the afternoon there is a chance of thunderstorms. We saw yesterday how chaotic rain can be at the mountain. It could be interesting with 20 laps to go if rain comes to Mount Panorama. When you combine that with how fast the drivers have been going so far this weekend, it shapes as being a similar race to last year, with plenty of action. We’ve seen it already with two big incidents in V8 Supercars and the Aussie Racing Cars. Yesterday Damien Flack survived a huge rollover down Conrod Straight during one of the Aussie Racing Car races. He suffered a collapsed lung and rib injuries, but it could have been far worse. That incident, like Mostert’s on Friday, was horrible. With the pace, and the grip on the circuit, more major incidents could happen today. Last year they were doing 2:07 times for the majority of the race. This could lower to 2:06 this year with Paul Dumbrell setting lap after lap of records in the Dunlop Series race on Saturday. With V8 Supercars a tad quicker there could be multiple race records broken today on the track. This increases the risk of crashes today and we saw plenty of them last year because the race had turned into a 1000km sprint. So who will win the Great Race? Like last year you could argue the case for around 15 combinations. If everything goes right for them then on their day they could win the race. With the grid positions also scrambled, after the rain affected sessions, it opens up the field like last year. The favourites for the race are Prodrive Racing who are looking for their third straight crown. Despite losing one car on Friday, David Reynolds will start from pole, with Mark Winterbottom to start from 14th in his Pepsi Max Falcon. Both combinations will be tough to beat with the strength of their car. If the weather is dry for the duration of the race then Red Bull will be strong as well. Jamie Whincup, who starts from eighth, has the fastest car on the track this weekend. With his co-driver, Paul Dumbrell, showing how strong he is after the win in the Dunlop Series yesterday this is a combination to watch. They will also be intent on righting the wrong of last year with the fuel dilemma. Craig Lowndes starts 15th in the other Red Bull and will look to charge like Whincup did last year from a similarly poor grid position. On the other hand, if it is wet, look out for Shane Van Gisbergen and Jonathon Webb. Both can drive well in those conditions and Van Gisbergen is the best wet weather driver in the field. They will come to the fore if it is wet. Others to look out for include Brad Jones Racing with Fabian Coulthard and Jason Bright. Both drivers are in the top ten and have shown pace this weekend. They will be hoping for some luck, though, after problematic races in the last few years. It is a similar story for Walkinshaw Racing, including the Holden Racing Team. They have two inside the top ten with Lee Holdsworth (fourth) and Tim Slade (tenth) performing well in qualifying. For HRT, who have qualified poorly, they have plenty to do with Garth Tander (22nd) and Jack Perkins (17th) further back. Write HRT off at your peril though. Tander and Luff are good racers and finished fourth in Sandown. For the other manufacturers the best looks to be Volvo with Scott McLaughlin and Alex Premat. They start from second and are right in contention for a breakthrough mountain win for the Swedish make. For Nissan the best combination for them looks to be James Moffat and Taz Douglas. They start fifth today and finished second last year. Fingers crossed for them they can do well without hitting the wall at Griffins Bend twice. Finally the Davison brothers for Erebus are right in the hunt after qualifying 11th and just missing out on the top ten shootout. They can do well today. Predicting a winner out of these 26 cars is tough. If you have a car in the office sweepstakes, good luck, and may the best team and car win. My only hope, like last year, is that the race is decided on the final lap and we have some first time winners in 2015. It promises to be a big day of racing and all of it will be here for The Roar from 10:30am.